When I was teaching math, I worked with many students like Olivia. She was a sophomore in high school and wanted to be an actress; her parents were artists; her brother was, without hyperbole, a guitar prodigy. Olivia’s family needed art like plants need the sun and, in an unfortunately common pairing, they all shared a distaste for mathematics. I spent much of my teaching career thinking about students like Olivia. By the time they reached me, by high school, their anti-math tendencies ran deep. By age fifteen or sixteen, my anti-math students had nearly two decades of math-negative signaling: parents who disliked math, dull curricula, and a predominant culture in the United States that treats math like magic instead of an accessible tool that everyone should learn to use (there is a lot of good discussion about this: try reading Petra Bonfert-Taylor’s Washington Post article about math culture). Sometimes I had a student like Olivia who actually believed me when I told her she could do math, who took the leap of faith and boarded my magic (not magic) carpet of math exploration. But just as often, my attempts to spark excitement and curiosity about mathematics in my anti-math students fell short. I began training to become a neuroscientist in part because of these students. I dwelled often on their brains compared to the brains of the math-lovers in my classes. I wondered how early in development children start to build concepts related to number, and how early differences in numerical development might begin that will, later on, manifest in school. I’ll get to their brains in a moment, but the first thing I realized–and many of you know this already–is that confidence and curiosity in mathematics can, and should, start young. From birth, even. Starting on day one, parents have the opportunity to promote an appreciation, if not a love, of mathematics1. There is a large consensus on promoting language and literacy from birth. The principles for promoting mathematics are tremendously similar. Plenty of evidence demonstrates how mathematical skills can be just as or more important than language skills in measurements of future success2. Unlike reading or speaking, babies already do math (well, they are at least able to discriminate between sets of two and three objects3). Head Start launched in 1965 in the United States as a program that supported disadvantaged preschool children and their families. Initially an eight-week summer program, Head Start grew to become an essential provider of early childhood support throughout the year, with classes, services, and outreach programs (Sesame Street, in fact, launched under Head Start funding in 1969). Importantly, Early Head Start was formed in 1994 to serve children ages zero to three–in response to research that indicated the importance of these years to cognitive, physical, and emotional growth. Figure 1. 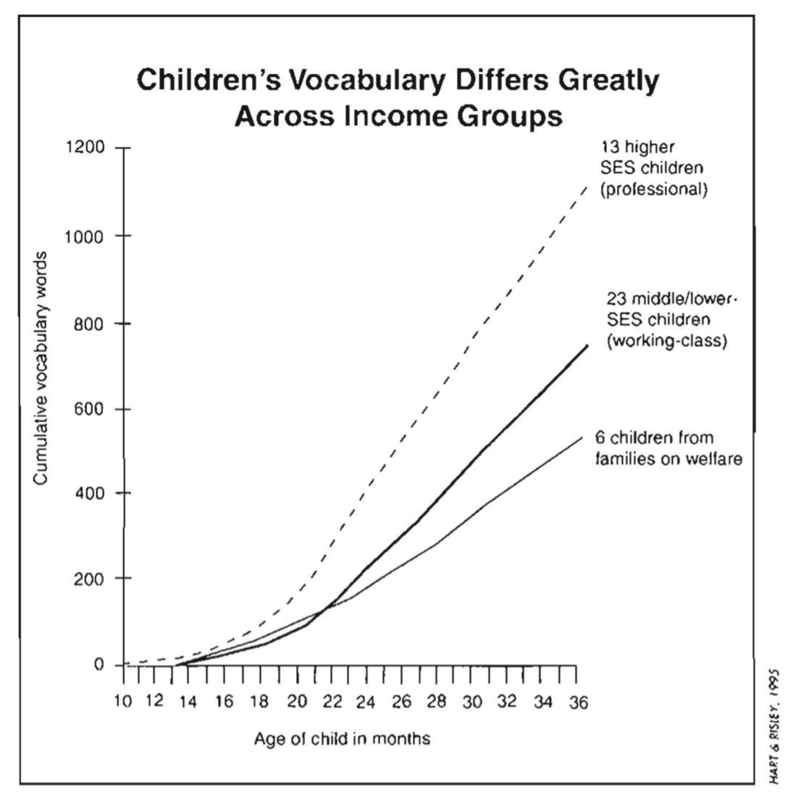 Hart and Risley’s4 research found that at higher levels of socioeconomic status (SES), children were exposed to more words (by volume) in their first three years. They referred to this phenomenon by the mnemonic “30 million words by age three”–i.e., by age three there is a difference of 30 million words heard when comparing high and low SES groups. 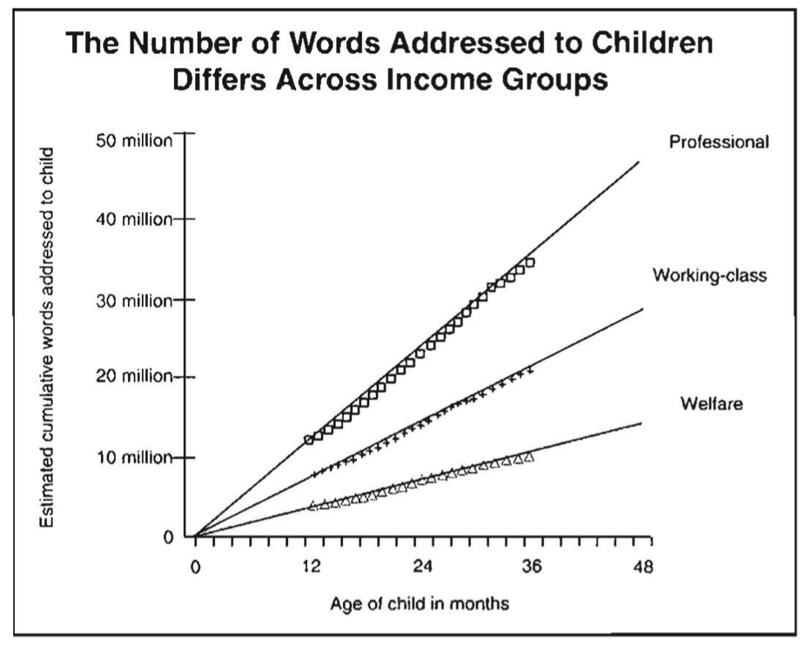 Figure 2: Hart and Risley note that difference in language received correlates to children’s productive vocabulary, suggesting that exposure to oral language skills from birth are important for future language development. Nowadays, I meet many parents who know the importance of “language nutrition” (to steal a phrase from Rose Hendricks’ article on this subject) and even know the importance of speaking to their infants. My brother and his wife, with their first child, knew that they should speak as much as possible with their newborn, even if they didn’t quite know why. I’m not writing about reading, however. I’m writing about math. And my point is simple: just as early exposure to oral language is important for language development and later reading, so is early exposure to numerical thinking to later math ability and appreciation. When children see their parents reading every evening, they (often) learn a love of reading. When children see their parents interact with and promote numerical thinking, they (often) learn a love of math. Skwarchuk, Sowinski, and LeFevre5 studied the home environments of four-year-olds and looked for correlations to numeracy and literacy scores one year later. They found that formal home numeracy practices predicted children’s knowledge of the symbolic number system and exposure to games with numerical content predicted children’s non-symbolic arithmetic. Another study from Libertus, Feigenson, and Halberda6 found evidence that in three- to five-year-olds, early understanding of small numerical quantities correlated to later mathematical ability. In summary, research and practice both support language and literacy development from birth. Research also provides evidence supporting numerical development from birth, but in my experience I have not observed an equivalent excitement for numerical development in the United States. I propose that we, as a culture, shift to show babies a world filled with oral language and numerical thinking. Math can affect later outcomes as much as reading! Duncan and colleagues2, in a longitudinal study of students from school entry to age 14, found that school-entry numerical skills correlated with later academic achievement more than school-entry language skills. 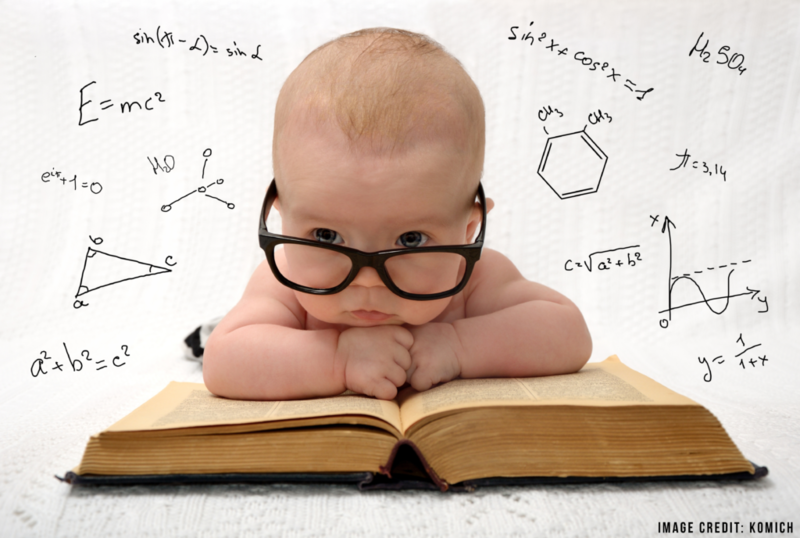 The authors write, “Before they enter preschool, children vary greatly in their numerical and mathematical knowledge, and this knowledge predicts their achievement throughout elementary school.” In another study from the National Research and Development Centre for adult literacy and numeracy in England7, researchers analyzed a massive longitudinal data set that followed infants from birth to ages past 30. They found that early numeracy and literacy both contributed to several outcomes in adulthood such as high-school drop-out rate, level of education achieved, rate of employment, and salary. In some subgroups, numeracy, more than literacy, predicted economic well-being, rate of home ownership, and even conflicts with authority. It is important to note that early numeracy and literacy are not the only measures that correlate with later outcomes. In the studies discussed above, the comparison between numeracy and literacy controls for other important factors such as socio-economic status, which has a strong correlation with all cognitive skills8. My point here is simply that early numerical ability is important for future development–not just in mathematics but towards significant life outcomes. I argue that this correlation between early numeracy and later outcomes is another reason that parents and teachers in the United States should promote numerically rich environments from birth. Animals do math. They count, compare quantities and perform basic operations. In a famous study of chimpanzees9, for example, subjects were presented with trays with different numbers of chocolate pieces, and they consistently chose the tray with the greater number. Other experiments have tested animals using different senses (hearing, touch, sight, etc.) and paradigms in which the number is independent of the reward: Church and Meck10, for example, gave rats a lever-pressing task in which rats listened to tones and pressed one lever for two tones and a different lever for four tones. They also found that rats had an innate sense of quantity. Research exploring the numerical abilities of babies has developed very clever methods for measuring their ability to detect number. Early studies relied on the fact that babies stare longer at novel scenarios3,11. When presented with two dots over and over, babies would lose interest and stare for less time at each presentation. But when the stimulus changed to three dots, babies would stare at the presentation longer. This kind of result has been shown with infants younger than one year and even in newborns. Later studies introduced different paradigms and better visual and spatial controls, and consistently found that infants detect numerosity12. Studies in neuroscience have provided some additional evidence for innate numerical abilities in human infants. For example, Izard and colleagues13 tested three-month-old infants by presenting arrays of objects in different combinations of number and identity. They might show, for example, three carrots and later show images with different numbers of carrots or the same number but with different objects. Using event-related electroencephalogram (ERP—this measures electrical activity in the brain after a specific stimulus is presented), they found that neural activity differed for number (i.e., same object but in different quantities) compared to object identity (same quantity but different objects). Number changes were uniquely marked by differences in the right parietal region of the cortex, while identity changes were uniquely marked by differences in the occipito-temporal cortex. Since the right parietal region of the cortex is a region that has been shown in older children and adults to be important for numerical processing, this study provides evidence that even at three months of age, infants may show early neural signatures of numerical ability. What is math for babies? Some clues as to which environmental factors are conducive to early numerical development come from studies that compare the effects of culture and language on pre-schooling numerical ability and the correlation of this ability to later academic performance. Many studies, for example, compare native Mandarin to native English households due to interesting differences in culture and language14,15. These studies note that Mandarin words for numbers are more clear about quantity than English words. For example, the English word “one” can mean the number one, but it can also be expressed in the plural as in “these ones are my favorite”. This ambiguity does not exist for the Mandarin number. The linguistic clarity for Mandarin numbers may contribute to the advantage of Chinese schoolchildren in mathematics compared to those in the United States (reported in the above studies). Other factors include formal education experiences with parents and parental views on the importance of academic learning. While these ideas are not complex or difficult, implementing them will involve changing individual and group-level habits, which can be quite hard, indeed. Changing numerical culture in the United States, however, would be extremely beneficial. Generally, the lesson I’ve gleaned from my years as a teacher and a scientist is: If we want to improve in any domain, we can improve K-12 and higher education (and we should! ), but pre-K might be just as important or even more. This is the period during which children are exposed to their new worlds and make unconscious decisions about how the world should be. In the case of Olivia, my math-phobic high-school student, I believe her distaste for mathematics began when she was born. Her parents, both math-phobic artists, probably avoided math language around her and promoted the arts over numerical games. Her early environment probably cascaded into other influences such as a lack of mathematical enthusiasm in her broader communities and, later, a couple years of negative classroom experiences. I believe, however, it is possible—and easy!—to promote mathematics and the arts or literacy. With newborns, it may be as simple as counting. Lefevre, J. A., Kwarchuk, S. L., Smith-Chant, B. L., Fast, L., Kamawar, D., & Bisanz, J. (2009). Home numeracy experiences and children’s math performance in the early school years. Canadian Journal of Behavioural Science, 41(2), 55–66. Duncan, G. J., Dowsett, C. J., Claessens, A., Magnuson, K., Huston, A. C., Klebanov, P., … Japel, C. (2007). School readiness and later achievement. Developmental Psychology, 43(6), 1428–46. Antell, S. E., & Keating, D. P. (1983). Perception of numerical invariance in neonates. Child Development, 54(3), 695–701. Hart, B., & Risley, T. R. (2003). The early catastrophe: The 30 million word gap by age 3. American Educator, 27(1), 1–6. Skwarchuk, S.-L., Sowinski, C., & LeFevre, J.-A. (2014). Formal and informal home learning activities in relation to children’s early numeracy and literacy skills: the development of a home numeracy model. Journal of Experimental Child Psychology, 121, 63–84. Libertus, M. E., Feigenson, L., & Halberda, J. (2011). Preschool acuity of the approximate number system correlates with school math ability. Developmental Science, 14(6), 1292–1300. National Research and Development Centre for Adult Literacy and Numeracy (2005). Does Numeracy Matter More ? London: Parsons, S., & Bynner, J.
Lee, V. E., & Burkam, D. T. (2002). Inequality at the starting gate: Social background differences in achievement as children begin school. Washington, D.C.: Economic Policy Institute. Rumbaugh, D. M., Savage-Rumbaugh, S., Hegel, M. T. (1987). Summation in the chimpanzee (Pan troglodytes). Journal of Experimental Psychology: Animal Behavior Processes, 13(2), 107-115. Church, R. M., & Meck, W. H. (1984). The numerical attribute of stimuli. In H. L. Roitblat, T. G. Bever & H. S. Terrace (Eds. ), Animal Cognition (pp. 445-464). Hillsdale, New Jersey: Erlbaum. Starkey, P., Cooper, R. G. (1980). Perception of numbers by human infants. Science, 210(4473), 1033-1035. Dehaene, S. (1997). The number sense. New York, NY: Oxford University Press. Izard, V., Dehaene-Lambertz, G., & Dehaene, S. (2008). Distinct cerebral pathways for object identity and number in human infants. PLoS Biology, 6(2), 275–285. Chang, A., Sandhofer, C. M., Adelchanow, L., & Rottman, B. (2011). Parental numeric language input to Mandarin Chinese and English speaking preschool children. Journal of Child Language, 38(2), 341–55. Miller, K. F., Smith, C. M., Zhu, J., & Zhang, H. (1995). Preschool origins of cross-national differences in mathematical competence: The role of number-naming systems. Psychological Science, 6(1), 56–60. Risley, T. R., & Hart, B. (1995). Meaningful differences in the everyday experience of young American children. Maryland: Paul H. Brookes Publishing Co.
Bonfert-Taylor, Petra (2016, April 25). Stop telling kids you’re bad at math. You are spreading math anxiety ‘like a virus.’ The Washington Post. My general inclination is not to make negative comments. However, the lack of understanding of learning not only in what the author writes but the articles he his referencing is astounding. Maybe frighting would be a better term. E.g. Does the ability to determine a difference in quantity require a mathematical ability? To suggest that Olivia’s math problems are an early environmental issue is inane to say the least. If he had bothered to ask, her response that math makes no sense would provide a clue as to the underlying issues: how the mind forms concepts, what conceptual tools were used for concept development, which aspects of a mathematical interpretive framework are missing, are there adequate symbol referent connections, etc. I suspect the author can not adequately articulate the nature of number, nor the magnitude of mathephobia in the population. Far too often the ability to do computations quickly and accurately is accepted as knowledge of mathematics. It is like claiming that an accountant is an economist. Jonathan is pursuing a Ph.D. in educational neuroscience at Vanderbilt University. He holds an M.Ed. from the Harvard Graduate School of Education. He has been a teacher, entrepreneur, researcher, and, when he was 15, bagel-maker.